Thank you Nicole for your articles! I just recently went back on my diet May 1st of this year and i have noticed more “shedding” of my hair than usual. I found myself crying and trying to figure out what was going on and then finally I found your articles!!! And I am so glad that this is temporary!!! I went back on my diet so my husband and I could start trying to have a family and did not realize how it would affect my hair. I started taking biotin to see if that would help and I was taking a pre-natal vitamin but my nutritionist said I didn’t need to because all of my vitamins I would be getting from my formula. How long did the excessive shedding go on for you? Thank you again for the articles they were definitely very helpful and reassuring! Hi Amanda – Thanks for reaching out and I’m glad to hear the articles were helpful! 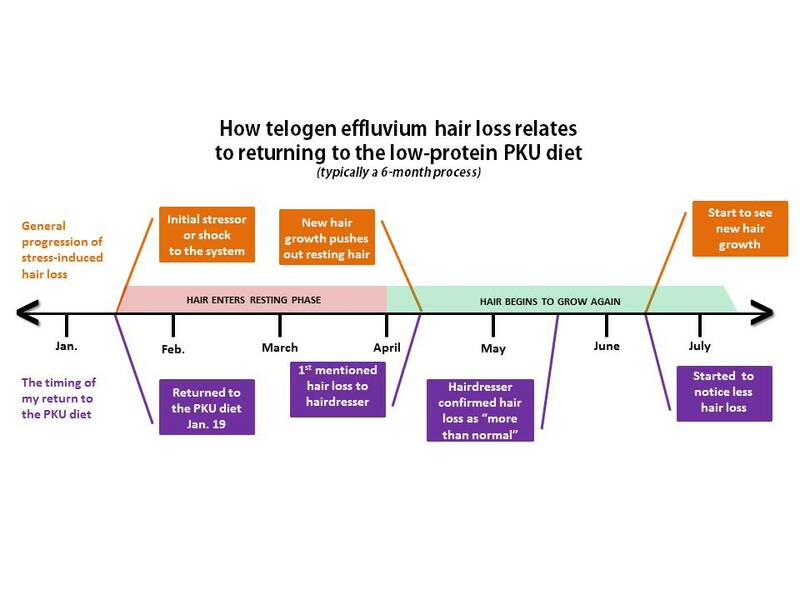 I’ve heard that the amount of shedding can vary among returning-to-diet PKU women. The good news is that if your hair is shedding, then you already have new growth coming in (the new follicle is pushing out the old hair). In my case, I found it helpful to cut my hair shorter (chin-length) to help speed-up the time it would take for my new growth to catch-up with my existing hair. As for the recommendation you received about not needing prenatal vitamins, that may be true with regard to hair loss, but you should still start prenatals in advance of conceiving because they have folic acid that is good for a healthy baby. Here’s more on the benefits of folic acid: http://www.babycenter.com/0_folic-acid-why-you-need-it-before-and-during-pregnancy_476.bc. Best of luck on returning to diet and eventually starting a family! Please keep in touch – I’d love to hear how you’re doing! Since my last post, I have been to a dermatologist and she said that she believes that the cause of the excessive hair shedding is due to me going off my birth control pills and doesn’t believe that it is my diet. I think that both factors may play a roll in what’s going on with my hair. She said that the shedding should start to slow down/subside maybe around November and that if it doesn’t then I’m to come back. I think I’m already starting to see a little bit of a decrease in the amount of shedding, but it’s still a little frustrating. My hair length is right around shoulder length, so I’m hoping I won’t have to cut my hair, but I guess we will have to wait and see. I will definitely keep you posted and let you know how things go. Thank you for responding to my comment! It is very stressful and it is very scary too! People are saying that they can’t see any differences in my hair, but I can definitely tell a difference because my hair feels thinner. I’m hoping that I’m starting to see the end of this, trying not to be too worried about it, but some days it can be really hard. I’m just starting to experience this myself and it is truly disturbing. I already have such fine hair to begin with. Is there any way to strengthen the hair? I went back on diet (to start a family) at the end of August. The past two weeks I have experienced major shedding and can see baby hairs poking through my scalp at my hairline near my face. I feel so vain even caring about this but the diet is tough enough. This is no fun. Traci, I totally understand what you are going through. This is such a traumatic experience and you are not being vain by any means whatsoever! Going back on the diet is hard enough like you said, and then add excessive shedding to the mix and well it just sends you over the top sometimes. I took a Biotin supplement to help the hairs grow faster and I’ve also heard that Safflower Oil is something you can use to help strengthen your existing hair. Also taking a prenatal vitamin will also help the hair grow a lot quicker too. Neither one of these affect your blood levels, I ran them both by my nutritionist before taking them. Unfortunately, the hairs that have gone into the resting phase are going to fall out and there isn’t anything you can do to prevent it. My hair was nice and long and thick until I went back on my diet and then the shedding started and right now it is thin, and I have so many new hairs coming in right now it is all over the place. It’s such a very hard thing to go through, but I promise it will get better. I hope this helps! Good luck to you and if I can be of any help or if you need any type of advice, please feel free to let me know and we can figure out a way to connect. Hope you are having a wonderful holiday season!!!! Amanda, I would love to connect, maybe we can go through this together! Feel free to email me at traci.hatling at gmail.com! My heart goes out to you because I know how emotional shedding your hair can be. It can be nerve wracking wondering if it will continue to come out or finally tapper off and you can go back to the normal PKU diet stresses. Amanda is right though. There isn’t too much you can do at this point. Your hair actually stopped growing months ago when you went back on diet in August. Hopefully, the baby hairs mean that the worst is over. I’ll email you off-line and we can chat more. Keep your chin up, girl!